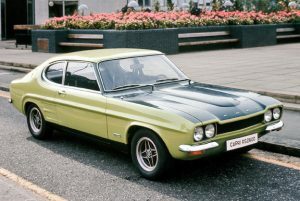 The need for an RS Capri was developed from a brief set by Jochen Neerpasch, Fords Competitions Chief in Germany, Neerpasch wanted to homologate the Capri for racing in Germany with the brief calling for a Capri which could be homologated to contemporary regulations: weight of 900kg and an engine that could be adapted to International Standards at 2.6 Litres. The green light for the RS2600 project was given in November 1969 with the Capri to be ready for the Geneva Motor show in March 1970. As a result of the short time frame the prototype presented at the Motor Show was fitted with a dummy engine. By April Fords Pilot Plant at Niehl (Germany) had constructed 50 RS2600’s in anticipation of homologation which was finally achieved in October 1970. In meeting the homologation 900kg weight requirement for racing the prototypes were stripped of their heaters, carpets and bumpers with the doors, bonnet and bootlid made of fiberglass and the rear and side windows made from Perspex. These weight saving requirements gained the 1st RS2600’s the nickname “Plastikbombe”. The paintwork was also reduced to 3 layers to assist with the weight saving. The racing RS2600 made its assault as a Ford backed team on the European Touring Car (ETC) Championship rounds for the 1971 season. 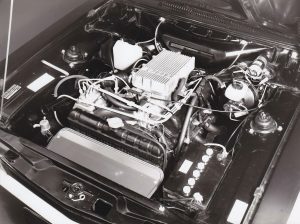 The engines initially developed 265bhp and with engine work undertaken by Weslake this had increased to 325bhp by the end of the 1973 ETC season. 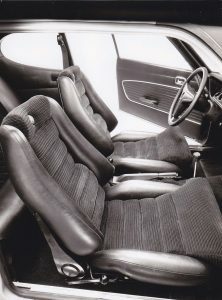 The road going Capri RS2600 weighed in at 1060kg with the all steel body work and heavier seats with the reclining Scheel bucket seats trimmed in black cord. The lack of front and rear bumpers still maintained the unique RS2600 look. RS2600 production began at Niehl in September 1070 with the cars being sold exclusively through Ford Rallye Sport dealers at a cost of DM 15,800, this was 50% more than the most expensive German Capri, the 2300 GT. The RS2600 was only sold across continental Europe and not in Britain. Production was limited to LHD. German 26M 2.6 Litre V6 engine with long throw crank giving 2637cc and 10:1 compression ratio. Kugelfischer mechanical fuel injection system with the injector pump mounted high up on the RHS of the engine and crank driven by an internal cogged belt. Development work undertaken and completed by Weslake of Britain. Standard road tune developed 150bhp at 5800 RPM (Redline) and 166lb ft of torque at 3500 RPM and achieved performance figures of ; 0 to 100 kph in 8.6 seconds with a top speed of 200kph. Indicating speedo to 220kph. Modified front cross member to move suspension arms outwards to provide negative camber. Competition single leaf rear springs. Standard Capri 4 speed external linkage box coupled to Atlas diff with 3.22:1 Ratio. Matt Black paintwork on the bonnet stretching around to the front pillars and glass work as well as the sills and rear panel. Four US style headlights with indicators inset below into the nose. Front wheel arches lightly flared housing light magnesium 6 inch Richard Grant alloys. No front or rear bumpers. 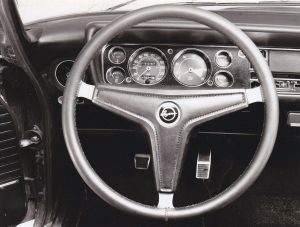 Deep dished 3 spoke steering wheel. Scheel fixed back sports seat for the race RS2600 and Scheel reclining buckets for the road RS2600. An October 1971 upgrade for the RS2600 saw it with the new AVO styled 4 spoke alloy wheels, the Granada gearbox, softer suspension giving a higher ride height, chrome front quarter bumpers and chrome full width rear bumper. As a road car the RS2600 was a greater success than Ford might have hoped, it was offered to homologate Fords racing program yet 3532 RS2600’s had been built when production ceased in early 1974 to make way for the RS3100.